CSI Team Building Activity is a concept inspired by the television series. 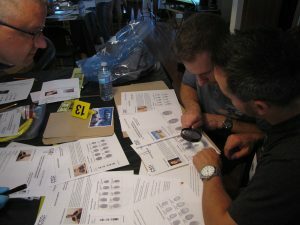 Throughout this CSI investigation, participants will play the role of police inspectors who must solve a fictitious crime. Participants will be required to inspect and analyse files, pictures, and evidence (finger prints, DNA...), suspects and witness interrogations, in order to solve the crime. Thanks to the contribution and know-how of each of its experts, the team will be able to identify the real culprit and resolve this crime by determining what really happened. No matter the version that you select, the CSI Team Building Activity is both fun and challenging, allowing participants to share information and collaborate to succeed.